There are many actor/director pairs out there that seem to have the ability to work together to create great films time and time again: Johnny Depp and Tim Burton, Martin Scorcese and Leonardo Dicaprio, Mel Brooks and Gene Wilder. After seeing The Heat last night, I am starting to believe that Melissa McCarthy and Paul Feig may be another one of those pairs. The basic outline of this film is a pretty classic one. You have the straight edge, goody two shoe FBI agent Sarah Ashburn (Sandra Bullock) and then you have the fly by the seat of her pants, break all the rules, rough and tough cop Shannon Mullins (Melissa McCarthy). Both Mullins and Ashburn have trouble getting along with their peers and their superiors, Ashburn because she is arrogant and has almost no social skills and Mullins because she refuses to follow orders and does whatever she wants. When Ashburn is sent to Boston to hunt down a Russian Mobster, Ashburn and Mullins are forced to work together to take the Mobster down. As I said before, the general plot and amusement of this film is a pretty classic story. When the two women first meet, they immediately don’t get along and try to get in each other’s way. They finally, and begrudgingly, realize that they may be able to help one another to solve a case that they both want solved. Don’t get too mad at me for saying this; I am usually not a Sandra Bullock fan but she was absolutely hysterical in this film. The chemistry between Bullock and McCarthy was perfect, both women hitting every comical line in the script with ease and skill. Beyond the two main characters, the film is filled with crazy characters and cameos. One of my favorite groups of side characters is Mullin’s insane family, including Michael Rapaport as one of her three brothers and Jane Curtin as her mother. Marlon Wayans plays the Boston FBI agent that was supposed to help Ashburn who slowly but surely became a love interest for the antisocial Ashburn. This was one of the funniest films I have seen in theaters for months. 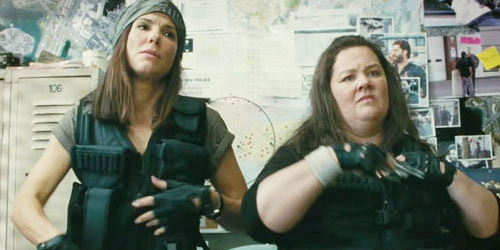 The Heat is rated R and it is certainly rated R for a reason. The main reason that the film is rated R is due to language, most of which comes from McCarthy. The end of the film does have a surprising amount of violence in it as well. This was a B+ film for me. After seeing it I can not wait to see what Paul Feig and Melissa McCarthy do next time they team up together. Well, I have the feeling that this review may get some people a little upset. I’m not going to bash the film as a whole because it was an outstanding film. What drove me absolutely crazy about the film was Scarlett O’hara. The last time I had such a negative reaction to a film character was when I met the despicably horrid Tommy Conlon in Warrior. I am going to do my best not to turn this review into a rant about Scarlett because this film deserves praise and a lot of it. 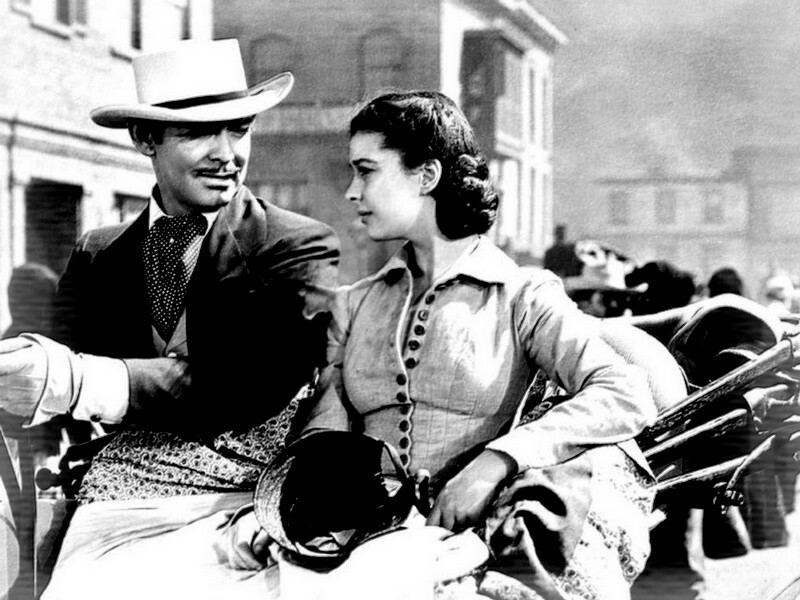 This film was based on a 1936 Pulitzer Prize winning novel written by Margaret Mitchell. The film tells the story of a wealthy Southern family as they attempt to survive the Civil War. The story opens at Tara, a Georgia cotton plantation, where Scarlet O’hara (Vivien Leigh) lives with her sisters and parents. Scarlett is in love with Ashley Wilkes (Leslie Howard) who is engaged to marry his cousin Melanie Hamilton (Olivia de Havilland). Ashley rejects Scarlett’s advances before leaving to fight for the war. In the process of pursuing Ashley, Scarlett attracts the attention of Rhett Butler (Clark Gable), a man who has been disowned by his family. Though she does not know him well, Scarlett marries Ashley’s brother and is quickly widowed when he is killed during the war. Scarlett continues to pursue Ashley while Rhett pursues Scarlett, vowing to win her over. Scarlett is sent to a house in Atlanta and the film moves forward eight months where the war has advanced well into Georgia. Scarlett travels across the war torn state to Tara to find it standing but in a state of disarray. Scarlett vows to do anything to help her and her family survive. Part two of the film picks up with Scarlett using anybody that will help to farm Tara’s land. As she works to get her and her family back on their feet, Scarlett realizes that she will not be able to pay the rising taxes from the North. Scarlett goes to Rhett for help but finding his bank accounts frozen she is forced to marry a business owner who was engaged to her sister. Scarlett becomes wealthy but becomes a widower again when her husband is killed. Scarlett quickly marries Rhett and the two have a child. A series of tragedies as well as Scarlett’s continued love for Ashley and advances towards Ashley drives a wedge between her and Rhett, leaving Scarlett vowing to win back Rhett’s love. When someone says character development many people (myself included) assume it means the character developed in a positive way. Scarlett’s character certainly develops throughout the film but not in a positive way. The film is split into two parts and each part ends with Scarlett making a vow. In the first part of the film we are introduced to Scarlett. When we meet her Scarlett is a spoiled brat that thinks she is entitled to whatever she wants. She flaunts herself around trying to take other people’s men and listening only to herself. When the Civil War rocks her world, Scarlet forces herself to grow up and take care of her family. In Part 2 Scarlett truly has grown up. She is no longer a helpless, dependent woman but has stepped up and started to take care of her family. Working the plantation herself, killing people that try to loot Tara and even stealing her sister’s fiance to become a wealthy woman that can provide for those at Tara, she will do anything to help her family survive. While Scarlett has grown-up her actions have not changed. She still acts like a spoiled brat but now she does whatever she wants with the excuse of saying she is just trying to survive. At the end of Part 2 Scarlett’s life is once again ruined and once again she vows to fix it. The difference between the end of Part 1 and the end of Part 2 is Scarlett’s life was ruined due to outside influences at the end of Part 1. At the end of Part 2, her life is ruined mainly due to her own actions. This film was absolutely gorgeous, using shadow and light to enhance the story and meaning. Shadows are heavily used with some scenes, like the birth of Melanie’s child, filmed with the characters completely in shadows. This was the second 3+ hour film I watched for my Oscar Best Picture and I expected it to be terribly boring. I enjoyed watching this film and understand why it is a classic. Gone With The Wind beat Goodbye, Mr. Chips, Love Affair, Mr. Smith Goes To Washington, Ninotchka, Of Mice and Men, Stagecoach, The Wizard of Oz and Wuthering Heights for the 1940 Best Picture. Beyond that Victor Fleming won for Best Director, Vivien Leigh won Best Actress for her portrayal of Scarlett, Sidney Howard won Best Adapted Screenplay, Hattie McDaniel won Best Supporting Actress for her portrayal of Mammy. The film also won Best Cinematography, Best Film Editing and Best Art Direction. I give this film an A-, an epic film that utilizes every tool in a director and cinematographer’s belt. I finally understand why this is at the top of so many best film lists. When I stepped into the theater the other day I had huge expectations for Iron Man 3. Though it seemed impossible, the film managed to live up to every one of my expectations and then some. Until the first Iron Man hit theaters, the iron clad hero wasn’t even a blip on my radar. I knew almost nothing about the hero. Now Tony Stark has become one of my favorites. The third installment in the Iron Man series pits Tony against The Mandarin and scorned enemies from his past. This was the best Iron Man so far for countless reasons. Here are some of my favorite reasons. •	Stark’s Split Mind: The events of the Avengers are not forgotten in this film, in fact they play a key role in the plot. Since Tony (Robert Downey Jr.) returned from New York he admits that nothing has been the same. He has been shown other universes and other worlds and it has changed Tony Stark. Unable to sleep and suffering from crippling anxiety attacks, we see a very different side to the superhero. Still sharp tongued, witty and brilliant, Tony Stark is on the verge of a mental breakdown throughout the entire film. This gives a whole new dimension to the cocky, seemingly invincible superhero. •	The Kid: About halfway through the film, after his house has been destroyed and Tony is on the run, we meet Harley Keener (Ty Simpkins). Harley is a young man whose father left him and who has an obsession with Iron Man. Harley’s character is not advertised at all but his relationship with Tony Stark is one of the best aspects of the film. The two help each other. Harley, a boy who feels abandoned, finds someone to believe in and Tony finds that sometimes good help and good advice can come from unexpected places. •	The House Party Initiative: The commercials have made no secret of the fact that this film features more than one Iron Man suit. The entire film features the Mach 42 suit, a suit with the ability to be called remotely and attach to Tony. The other suits don’t really come into play until the final battle but it is a truly outstanding battle. 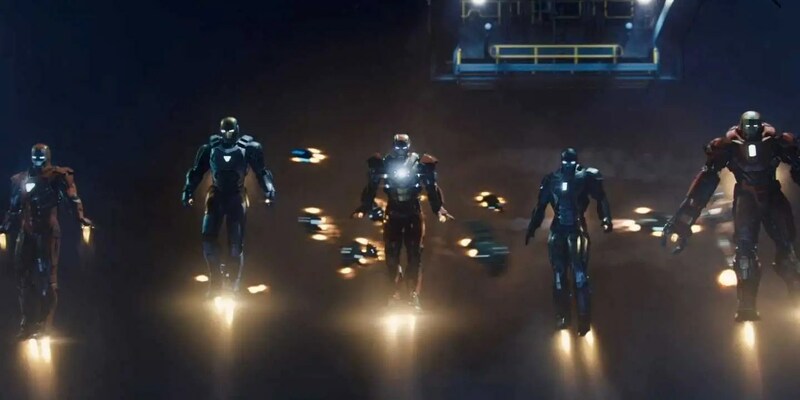 With Jarvis (Paul Bettany) controlling the suits, Tony Stark leaps from suit to suit as he and Jarvis battle hordes of nearly invincible enemies. This made for a fantastic and unique battle. •	The Director: Jon Favreau, who directed the first two Iron Man films, was not the man behind the camera for the third installment. Instead Shane Black, director of one of my favorite films Kiss Kiss Bang Bang, takes the reigns. His directing style becomes apparent right away as the film opens with a voice over from Tony Stark. Robert Downey Jr. and Shane Black have already proven to work well together and Iron Man 3 only solidifies the trend. A little darker than the first two films, Black brings his own flare and style to the best Iron Man film yet. •	The Villain(s): While the film did not keep the many Iron Man suits a secret, they did keep a lot of secrets about the film’s villains so I am not going to ruin anything here. The villains in this film were outstanding. Ben Kingsley gave an amazing performance as the Mandarin and other terrifying villains (whose identities I don’t want to ruin) also give great performances. The hierarchy of the villainy in this film was filled with genuine shock and awe, creating some of the biggest twists and turns in the film. Oh also, most of the villains were immortal with the ability to heal themselves, super strength and the ability to heat up their body to super human temperatures. I could keep listing off reasons as to why this film was amazing but I’m pretty sure that you would get tired of reading…eventually. Obviously, I would recommend this film to anybody that likes Iron Man, the Iron Man film franchise or super hero films in general. This film however, like many of the super hero films coming out, is for more than just comic book nerds and children. Super hero films, starting with the first Iron Man, have changed to appeal to a much wider audience. I would recommend this film to anyone from my eight year old cousin to my seventy five year old grandfather. It was witty, funny and action packed. It had a good plot that was not just based around fighting and delved into some pretty deep topics, most of them involving the mental state of Tony Stark. This is an A film for me. See it in theaters, the experience is easily worth it. The word perfect is a word I try to avoid using when I’ve reviewing a film but it’s going to be difficult not to when reviewing Ordinary People. Every aspect of this film melded together beautifully (I almost typed perfectly there). Expect directing accompanied acting performances that were real, raw and mind-blowing. The music told its own story, building on the well-written script. It is not a happy film, in fact it is very depressing, but Ordinary People is an example of a near perfect film. The film is about the Jarrett family after they have suffered a terrible loss and tragedy. The main character is the youngest son, Conrad Jarrett (Timothy Hutton), who has tried to commit suicide after the death of his older brother Buck Jarrett (Scott Doebler). The film begins well after the tragic incidents occur. Buck has passed, Conrad has attempted to end his life, been admitted to a mental hospital and released. We watch as Conrad attempts to return to normal life. His father, Calvin Jarrett (Donald Sutherland), is as supportive as possible, encouraging and eventually convincing Conrad to see a psychiatrist Doctor Tyrone Berger (Judd Hirsch). Conrad’s mother, Beth Jarrett (Mary Tyler Moore), is the exact opposite. Unable to deal with the loss of her favorite sun, Beth can no longer connect with Conrad. She is only able to think of how things affect her and cannot give her “sick” son the love and attention he needs and deserves. There are no words to describe how fundamentally sad the relationship between Conrad and Beth is. They cannot give each other any emotion as Conrad desperately works for his mother’s love and his mother desperately tries to sweep all her pain and sorrow, and everything that reminds her of it, under the rug. When watching a film, there tends to be performances that stand out and some that get lost in the shuffle. They are not necessarily bad performances; they just are not as good as the rest. In this film there was no getting lost in the shuffle, every performance was absolutely brilliant. Mary Tyler Moore steps out of her acting comfort zone, playing a character that is in no way likable. It is difficult not to feel bad for Beth but her actions and reactions to the tragedy are unforgivable. She lost a son, that much is true but that does not excuse her from giving up on the rest of her family. Timothy Hutton gives the performance of his life, earning himself an Oscar for Best Performance in a leading role. Donald Sutherland is heartbreaking as a father that is watching his family crumble around him and desperately trying to hold it together. One of the biggest surprises of this film for me was the directing, not just the directing skill but who the director was. Robert Redford makes his directorial debut and proves that his cinema talent does not simply lie in acting. Redford skillfully wields the camera. Every scene was artfully composed, reflecting the attitude and mood. Redford also proved himself to be a master of transitions. Scenes were split by quick, sharp cuts while others faded away softly. Many important parts of the story were told in flashbacks, sprinkled throughout the film to create some breath taking scenes. One of the best scenes in the film in which we are finally allowed to realize how Buck died occurs when Conrad has a breakdown in the middle of the night and gets ahold of his therapist. Conrad finally relives the death of brother, showing the audience the events through a series of quick flashbacks. Ordinary People beat Coal Miner’s Daughter, the Elephant Man, Raging Bull and Tess for the 1981 Oscar for Best Picture. While I have not seen any of the other nominated films I can say that Ordinary People deserved the win. If you doubted my review of Redford’s directorial debut then you should learn not to doubt me. Robert Redford took home an Oscar for Best Director, Timothy Hutton won for Best Actor in a Supporting Role and Alvin Sargent won for Best Writing. Both Judd Hirsch and Mary Tyler Moore were nominated for their performances but neither took home the win. 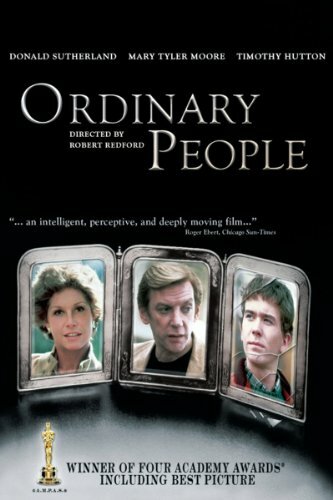 Ordinary People is a depressing but hopeful example of a brilliant film. In my book this is a 10 out of 10 film, a nearly perfect example of an Oscar Best Picture Winner. When I picked the film Jeff Who Lives at Home, I did not know that I was picking another Duplass Brothers film. I’m not upset that they made the film, its just odd that I picked another one after reviewing the Puffy Chair (another Duplass brothers film) just a few weeks ago. Just like The Puffy Chair, Jeff Who Lives at Home was a truly bizarre and unexpected film. The theme of the film is fate and the film looks at three different characters: Jeff, his brother Pat and their mother Sharon. We follow these characters as their stories intertwine and eventually collide. •	Jeff (Jason Segel): Jeff is in his thirties and lives at home with his mother. Jeff is also a pothead and his only job on the day the film takes place is to go and get wood glue. What seems a simple task for most is not so simple for Jeff who sees a pattern to the world that most do not. Today is not just a day in which he has to get wood glue, it is a day that a man named Kevin is supposed to change his life. While venturing out of the house, Jeff follows a string of signs that he believes the world is giving him. The signs lead him to get mugged, find and help his brother (multiple times) and eventually leads him to a traffic jam on a bridge where he must save a family from certain death. •	Pat (Ed Helms): What should have been a normal day turned into a near disaster for Jeff’s older brother. While Jeff is out following the “signs” he stumbles upon his brother. It quickly becomes clear that the two brothers are not as close as they should be, they seem to have trouble understanding each other. Accidentally finding his wife, Linda (Judy Greer), having lunch with another man, Pat realizes his marriage might be in danger. With the help of his brother, Pat embarks on a journey to save his marriage and the two brothers realize how much the mean to one another along the way. The quest leads them to the traffic logged bridge where Pat runs through the lines of stopped cars to find and win the affection of his wife. •	Sharon (Susan Sarandon): In what is one of the oddest story arcs I have seen in quite some time, Sharon is fed up with her life. She is alone, after her husband passed, and annoyed with her job, life and children. Working in a cubical job, Sharon seems to feel empty, desperately searching for something she can’t grasp. When a secret admirer approaches her, claiming to understand her and want to be with her, Sharon allows herself to feel hope. After thinking she got stood up, Sharon’s secret admirer accidentally reveals themselves and inadvertently forces Sharon to make a decision. Her decision, just like her sons’ decisions, leads her to a bridge only to be stuck in a traffic jam where she finds her two sons. Throughout the course of watching this film, I had trouble deciding if I liked it or not. It was full of dark, dry humor that perfectly offset the overall depressing tone of the film. Beyond a depressing tone, the film also acted like a crescendo. The handheld style of filming and Jeff’s character makes the film seem as if it is building to something epic, something epic that does not fit with the simple plot we have already seen. The more we travel with Jeff the more we realize that there is something bigger happening, there is something beyond what we can see in front of us. The film works to get the audience to follow the signs Jeff is following. When it ends with Jeff and the audience getting their epic moment, it is one of the more satisfying moments in cinema. I did not realize how much I enjoyed this film until I started reviewing it. Jeff is the oddball in the film, the one that nobody understands but the script and directing almost forces the audience to connect with him. While the other characters are dealing with “normal” problems, the audience gets caught up with Jeff and his grandeur, paying off at the film’s conclusion. I give Jeff Who Lives at Home an 8 out of 10, a score that surprises even me. Give this movie a chance, even if you don’t like it at first. As long as you get invested with the characters, it will pay off in the end. I’ve talked a number of different times in a number of different posts about how expectations can affect a person’s opinion of a film. Expectations can make or break a film, making them a potentially dangerous thing to have. I went into the new animated film Wreck-It-Ralph with high expectations; in fact I don’t remember the last time I was so excited for an animated film. Though it wasn’t exactly what I expected it to be, Wreck-It-Ralph met all my expectations and then some. Wreck-It-Ralph (John C. Reilly) is the villain not of just the film but of a fictional arcade video game called Fix-It-Felix Jr. Ralph’s job in life while the arcade is open is to destroy a building that Felix (John McBrayer) must then fix. Once the player beats the game, Ralph is hurled from the building into the mud. Ralph would be fine with that life if things were different once the arcade closed. Once closed, the characters from each game are free to do as they pleased in the video game world. Each arcade game has its own world and all the games are connected by Game Central Station but even after the game is done, Ralph is still treated like a villain. Forced to live in a dump alone, Ralph desperately wants the rest of the characters in his game to realize that being a bad guy doesn’t necessarily make him a bad guy. Determined to prove his worth, Ralph beings game jumping, something a character shouldn’t do, to try and earn himself a medal. The problem with game jumping is that if you die in a game that isn’t your own you don’t regenerate; you’re dead for good. Ralph visits two different games while game jumping, the first being a space set, alien first person shooter called Hero’s Duty (and the film does not overlook the puns that can be made with duty). Under the command of Sergeant Calhoun (Jane Lynch), Ralph is to help the First Person Shooter make it to the top of a tower without letting the cybugs (vicious alien robot bugs) destroy them. After failing miserably, Ralph decides to find his own way to the top to retrieve his own Hero’s medal. Ralph is successful in retrieving the medal but also inadvertently launches himself and a cybug into another game. 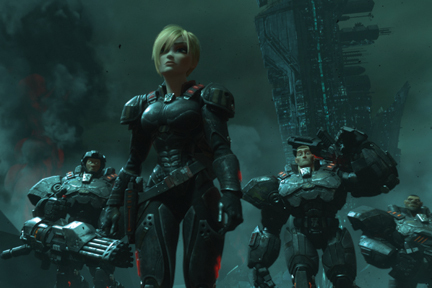 Sergeant Calhoun follows Ralph, determined to kill the rogue cybug. If left unchecked, the cybug will multiply, eventually destroy the other video game worlds. Calhoun is accompanied by Felix, who is searching for Ralph. Without Ralph to be the villain, the arcade owner Mr. Litwak (Ed O’Neil) assumes the game is out of order and is prepares to unplug it. The second video game world that Ralph inadvertently visits is the racing world of Sugar Rush. In an environment made entirely out of candy, Sugar Rush is a world similar to Mario Kart where racing reigns supreme. Run by King Candy (Alan Tudyk) each night racers race to become one of the eight avatars the children in the arcade can chose to race as the next day. Ralph meets a young racer named Vanellope Van Schweetz (Sarah Silverman) who dreams of racing but is not allowed to because she has been labeled a glitch. After she takes Ralph’s medal, the two work together to try and help her win her first race. As the two work together and grow closer as friends, Ralph becomes suspicious of King Candy and how Venelope actually became a glitch in the first place. The film continues to mix different game genres as Venellope, Ralph, Felix and Calhoun come together to save the land of Sugar Rush, defeat the cybugs, defeat a surprise enemy and save Venelope’s very existence. 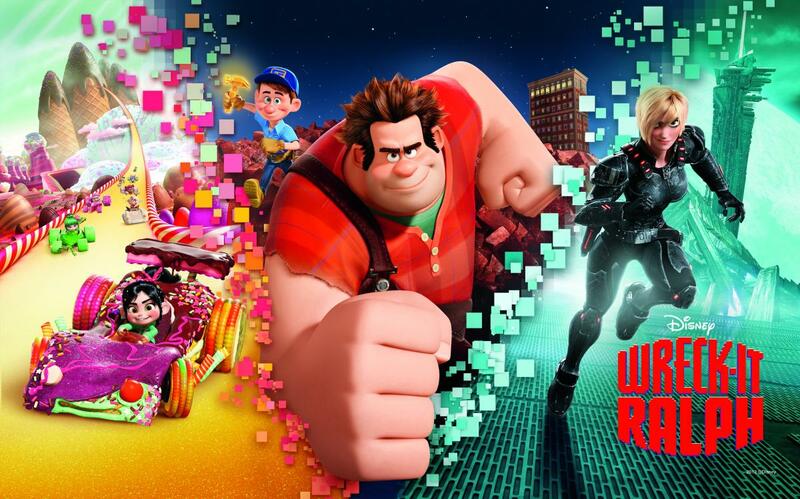 Wreck-It-Ralph was one of the more unique and clever films I have seen in theaters in a while. I am a twenty-three year old video game nerd and the film appealed to me. I also believe that it could easily appeal to young children, old children and even adults who may not have much video game knowledge. With well thought out, lovable characters and rich, lush environments, Wreck-It-Ralph has all the elements of a great animated film. Beyond that however are some well placed, well integrated video game references that prove how clever the creators really are. The references were subtle, like the way the characters moved like video game characters or in a montage where we saw the arcade age 30 years, many of the video games that passed through were classic games. 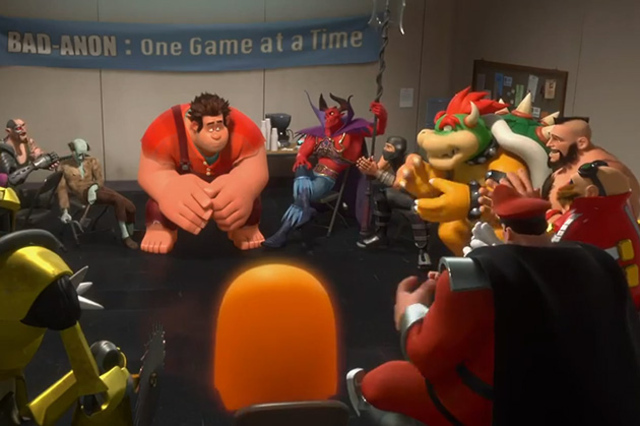 Even in the opening scene, when Wreck-It-Ralph is at a support group for bad guys, each other member of the support group was from a famous video game. The main complaint I heard about this movie was that though the ideas in it were unique, the story itself wasn’t. The film starts with conflict, then the main character meets a friend and they grow close before something bad happens to make them fight (Ralph and Vanellope). The fight escalates to make the audience sad, then the main character finds his friend and apologizes so they can go on to defeat the villain. It is a common outline for animated movies but this film took the common outline and elevated it to the next level. I found every aspect of this film to be thoroughly unique from beginning to end and give it an 8 out of 10. It is a great animated film that will please gamers and non-gamers alike. Oscar Best Picture Winner 1969: Oliver! In 1960, across the sea in Britain, a musical premiered based on Charles Dickens’ classic take, Oliver Twist. The play was called Oliver! an was not only popular in Britain but had quite a successful run on Broadway and had a number of different revival tours. In 1968, just eight years after its premiere, the play was turned into a film, a film that won the 1969 Oscar for Best Picture. 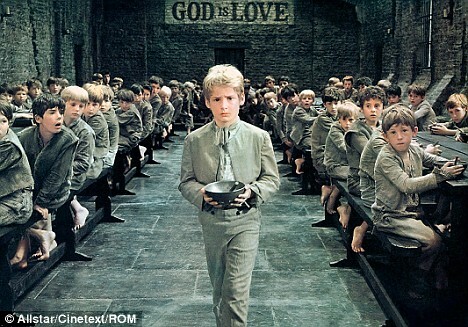 The story mirrors that of the novel, starting with a young boy named Oliver Twist (Mark Lester) who is living in an orphanage. With no information at all about his parents of his family, Oliver eventually runs away from the orphanage to London so he can make his fortune. 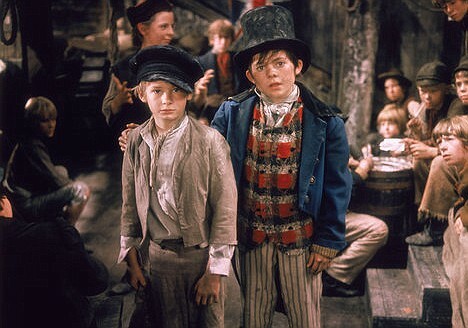 The first person Oliver meets in London is a young boy about his age, the Artful Dodger (Jack Wild). Realizing that Oliver has no place to live, Dodger brings him to a name named Fagin (Ron Moody). The elderly Fagin lives with a group of twenty young boys, all of whom roam the streets of London pickpocketing whatever they can get their hands on. Fagin takes in Oliver and for a while, Oliver becomes a member of the thieves’ gang. When a job goes wrong, Oliver ends up being taken home by Mr. Brownlow, a man who may have ties to Oliver’s past. Nervous that Oliver is going to sell them out, one of Fagin’s adult partners, Bill Sikes (Oliver Reed), is determined to not only get Oliver back but to keep him from leaving them ever again. The film ends as Bill drags Oliver on a dangerous mission and Oliver’s friends desperately attempt to try and help him. While the film has many comedic and dramatic parts, at its core Oliver! is a musical and lets the audience know that right off the bat. The musical numbers are done with the extravagance that can only be done in a film. Most numbers took place while winding through the streets of London with store clerks, street sweepers, street cart employees and butchers all joining in on the dancing. Extravagant, lengthy and full of theatrics, the songs are all very entertaining, featuring adults and children alike. Few adults are featured on the songs, other than background singers and the occasional solo from Fagan and Nancy (Shani Wallis), Bill’s girlfriend. What really impressed me, from a musical aspect, were the children. Though Oliver’s voice was a tad feminine for my liking, he seemed to approach his solos timidly but it quickly became clear that it was just quiet confidence. My favorite performer in the film however was the Artful Dodger as he mischievously danced through the streets, stealing and causing havoc as he did. I can understand why this film won Best Picture based solely on the musical scenes. They were theatrical, well done and were the highlight of the film. The rest of the film was hit or miss for me. Set up to seem like a play, the film begins with a black screen, as if the curtains are drawn, while the orchestra plays and overview of the songs that are featured in the first act. After the first act is completed, the film gives the audience an intermission; once again letting the screen go black while the songs for act two are played. When act one finished, I didn’t know if I was going to finish the film. The musical numbers were good in the first act but ultimately I found the film to be quite boring. The only two things that pushed me to finish the film were Ron Moody’s oddly intriguing performance as Fagan and, the highlight of the film, Jack Wild’s charming portrayal of the Artful Dodger. As act two progressed, I found myself happy that I continued the film for it was leaps and bounds better than the first. While the first act featured almost nothing but songs and uneventful story, the second act included drama, suspense, violence and murder, making me wonder if the same person directed the first and second acts. So, while the film was very slow to start, it ended up proving that it was deserving of Best Picture. In 1969, Oliver! went up against Funny Girl, the Lion in Winter, Romeo and Juliet and Rachel, Rachel in the Best Picture category. I have seen none of the other nominees so I don’t know how they compare to Oliver! but I believe that Oliver! deserved the win. As far as entertainment goes, I give this film a 2 out of 5 and as far as it being a good film I give it a 4 out of 5, which means, overall, the film gets a 6 out of 10. Following a classing storyline and creating some very impressive musical numbers lead by a cast of adorable kids, this is a surprisingly interested adaptation of Dickens novel.